Now that I have a bunch of enemies being spawned in the dungeon, I need to make them smarter. Technically, I need to extend their capabilities, but make their behaviour fun-er. I want to have high standards for my AIs, but at the end of the day they are cannon fodder. They should be dumb and easily killed. Their job is to appear like they are doing something and making some sort of decisions. Their job is mostly to respond to the player, because the game is really about the player. From there it could go to the actual states that deal with the specific behaviour. But the problem is adding random stuff to this or somehow switching between the states. The brain FSM has the unfortunate consequence of having its concrete states and switches too rigid and pre-determined. 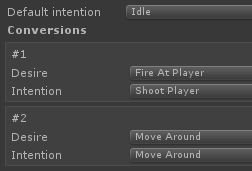 I really need to do more random enemy behaviours and I realize I cannot get away with just the brain FSM I have. So my current idea is to use a very simple belief-desire-intention implementation. Desires can only be selected if they have at least some minimum score — this avoid some bad initial desire selection from 0. This means there can be no desire, so the intention will default to Idle. And desires can be switched only if they pass each other sufficiently — thi avoids quickly switching between desires. This is one of those features that doesn’t have real design. 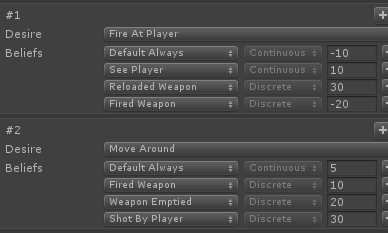 I just keep adding rules and checks, but at the end of the day I’m just fiddling with numbers until it looks good. In fact, everything interacts with everything, so any value could have a cascading effect. 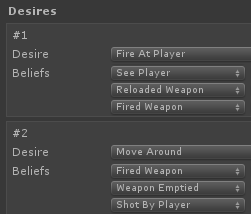 For example, change enemy move speed or enemy weapon fire rate and all the values go weird. Thankfully, it’s quick to iterate. Anyway, now that I have my new AI framework, I can work on expanding it. There is still a lot to cover here and I will be adding new desires soon and covering that in next posts.